How to Unpin a Tweet in Twitter– If you want one is your best tweet to appear on the first when someone visits your Twitter profile? You can set that top-performing tweet pinned to your Twitter profile. 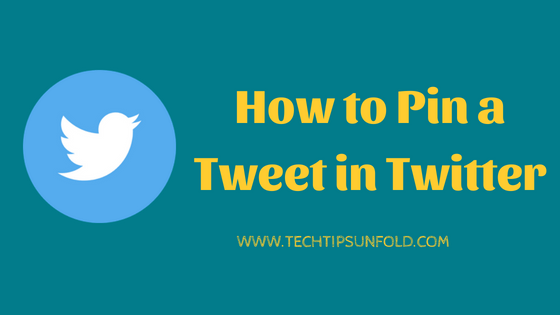 So in this article, we will discuss How to pin and unpin a tweet in Twitter. Twitter is a micro-blogging platform where anyone can share views and thoughts with their followers. Twitter is very popular among politicians and celebrities. It is the best platform for them to get in touch with their supporters. Initially, there was a restriction on the number of characters in a tweet to only 140 but now it is doubled and we can express ourselves completely with this new update. There are many more new features are being introduced by Twitter in recent times. Pin and Unpin a Tweet is one such feature. In this article, we will give you a complete guide on How to Unpin a Tweet and how to pin a tweet. Pinned Tweet is the first thing that appears when some open Twitter profile. Pinned tweet draws maximum attention of users. So Twitter-ers used to pin their most performing or popular Tweet to their profile. 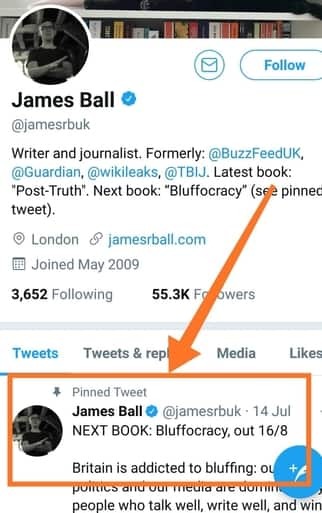 You are allowed to set only one of the Tweets as a Pinned Tweet to your profile. We can’t set Re-tweet as a pinned tweet. Only one of our own tweets can be set as Pinned Tweet. When you find someones tweet with Pin symbol, then it indicates that it is set as the pinned tweet. Refer to the below image for pinned tweet example. So in this step by step article, I’ll take you through How to Pin and Unpin a Tweet in Twitter from both mobile phone and PC. If you’ve not installed Twitter app, go ahead and install using the below link. You can get access to twitter with its user-friendly mobile app. Step 2: Now click on profile picture on the top. Step 3: Select the profile option to view all your tweets and profile information. Step 4: Navigate to a tweet that you want to pin to your profile. Step 5: Choose drop down like symbol to view the actions related to that particular tweet. Step 6: You’ll find ‘Pin to profile‘ option. Tap on that. Now scroll up to the top of your tweets to find the pinned tweet. Step 2: Click on the profile pic on the top and then on Profile. It will take you through all these tweets. Step 3: You can find your pinned tweet on top. Step 4: Tap on the drop-down icon in that tweet and select unpin from the profile option. You can set only one tweet as your pinned tweet. If you already have a tweet pinned to your profile and you’re trying add new pin tweet now, it will pop up a message saying, your current pinned tweet will be replaced by new one. Once we confirm, old pinned tweet will be unpinned and new one will be pinned. If you don’t have a Twitter mobile app (Android/iOS) installed on your smartphone, then you can pin or unpin a tweet in Twitter from your laptop. Step 3: Now click on Tweets just below your profile picture. Step 4: You can see the list of all your tweets now. Now navigate to the tweet that you want to pin to your Twitter account. Step 5: Tap on the drop down like button in that tweet. Step 6: Choose pin to your profile page option. Now, a confirmation message will display stating that old pinned tweet will be replaced. Step 7: Confirm by clicking on the OK button. Refresh the page to see new tweet pinned to your Twitter profile page. Unpinning a tweet in PC is also quite similar to how we do pinning a tweet. Step 4: You can find your existing pinned tweet on the top. Step 5: Select the drop-down icon on that particular tweet and select ‘Unpin tweet from profile page‘ option. So this is the detailed and step by step guide on How to Pin and Unpin a Tweet in Twitter using mobile phone and PC. If you have any queries regarding How to Unpin a Tweet in Twitter, feel free to share via the comment box below.